The Federal Reserve said it will hold rates steady and signaled it would likely not raise rates for the rest of the year amid worries over economic growth. In a statement, the Fed stressed again that it will remain patient in making future rate changes. The decision marked a change from the past few years. The Fed increased rates four times in 2018 and and nine times overall since December 2015. It said in its minutes that economic growth has slowed from the fourth quarter of 2018, citing weaker household spending and fixed business investment. Fed officials further indicated that it would only raise rates one time in 2020. One indicator of this economic slow down has been the housing market. In January, existing home sales dropped to 4.95 million, the lowest number since November 2015, according to a recent report from the National Association of Realtors. Inventory, meanwhile, seems to keep rising. A new report by Re/Max showed that housing inventory rose 5.8 percent in February for the fifth consecutive month. Now, 11 out of 17 Federal Reserve officials said they did not project rates to increase this year. This means that the Fed’s benchmark rate will likely stay between 2.25 and 2.5 percent for the rest of the year. In December, just two officials expected the Fed to hold rates steady in 2019. Fed officials are now expecting the economy to cool down more than previous projections. 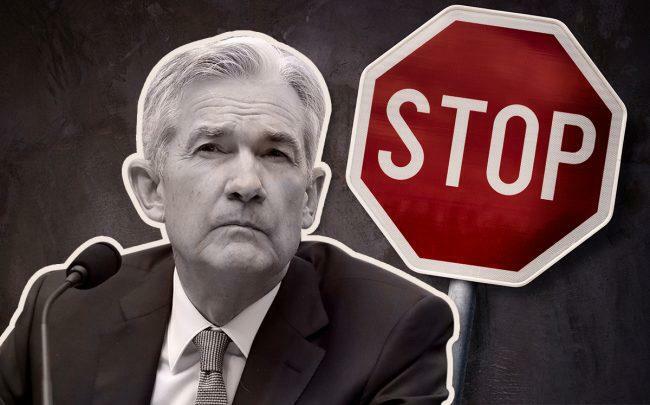 As a result, the Federal Reserve also announced that it would take a step back on its previous plans to downsize its huge portfolio of government-backed securities. The Fed has a $4 trillion asset portfolio of securities that it purchased during the financial crisis in order to boost the economy. It’s been trying to reduce that portfolio for two years as the economy has improved by letting notes mature. It now said it will stop the runoff in September as the economy is slowing down.